So, sometimes it’s funny how things work out. As you are probably aware (as you’re reading this review), I’ve spent much of the winter playing and writing about games from Essen 2014. With the increasing number of games being released at the show, it is taking longer and longer to get them all to the table… I’m just about to the end of the list games – and wouldn’t you know it, but two of the games that I didn’t play until February are going to end up in my top 5 for Essen 2014! Royals has been staring us in the face for a few months now – but for a number of reasons, it just didn’t make it to the table. I think part of the issue was that the game which Royals is developed from, Heads of State, didn’t have a great track record, and that often caused at least one of us to shy away or exercise a veto in favor of a different game to play. To digress a bit, Heads of State was one of those games that was just snakebit from the start. From what I have heard (though this is not-official nor confirmed), the original artist in charge of Heads of State had some sort of health emergency in his family, and he had to pull out of production at a very late date. As things go now, the production schedule is super tight near Essen time, and the business plan was counting on a game at Essen, and the production plant had already reserved time on the press to make the game – and some last minute graphics had to be done for the game. While functional, it looked like some amateur Photoshop job was done at the last minute. The appearance of the game turned off a lot of gamers back in 2008. Additionally, gameplay-wise, it is a little more confrontation than a traditional Eurogame, and this also pushed away some of the traditional Eurogamers. I’ll start off the review by simply stating: Royals IS NOT Heads of State. It is a much refined version that plays quicker and eliminates a lot of the analysis paralysis that plagued the original game. (More on this later). 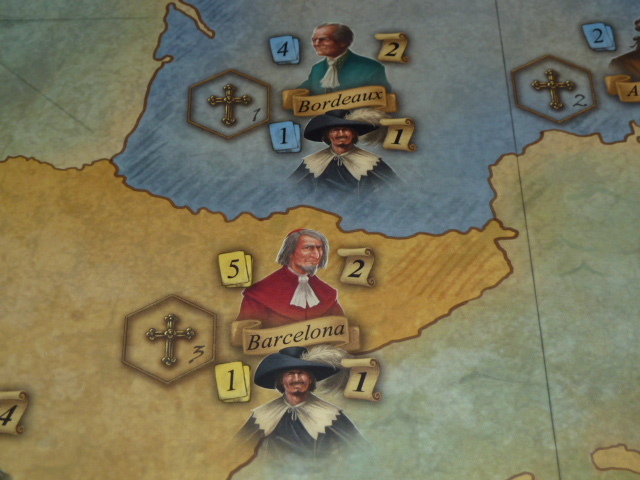 So, in Royals, players take on the role of a Noble Family of Europe, trying to place their family members in influential positions in each of the four countries on the board: Spain, France, England and Germany. In the various cities of each of these countries, one or two offices are available. The smallest country is England – with 5 offices spread out over 3 cities, and France is the largest with 9 offices in 5 cities. 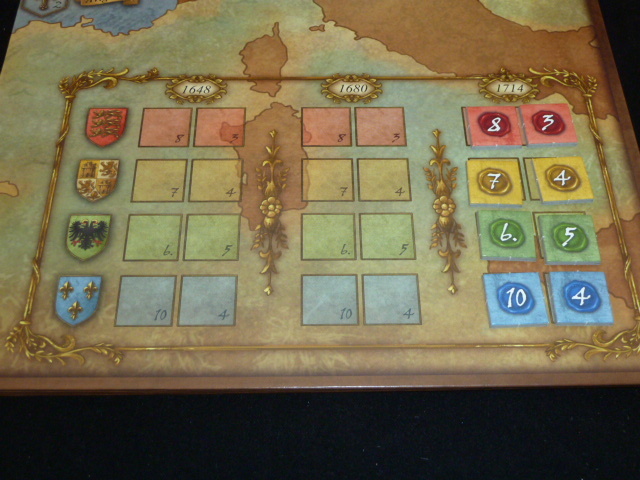 Each of the 7 different offices (Marshal, Baron, Countess, Duke, Cardinal, Princess, and King) has a scoring tile next to the board. Each of the four countries has a varying distribution of these offices. There are 2 decks of cards in the game. The larger deck is made up of country cards – these are cards which simply have the color and name of one of the four countries. There is a display of three face up country cards and a face down deck. 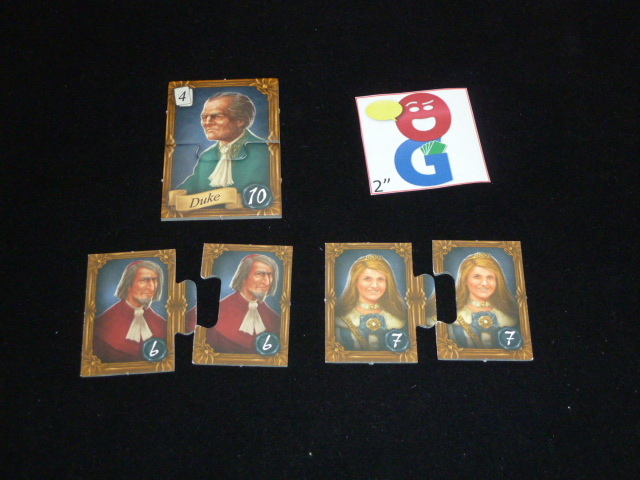 The other deck is the Intrigue deck – these cards have two countries on each – 4 each of the 6 possible permutations. There is no display of Intrigue cards, only a facedown deck. The entire game is played over three rounds. Each round is timed by going thru the Country card deck. At the end of each of the round, there is an interim scoring done – and then at the end of the game there is a final bonus scoring of the office tiles. After you draw cards, you may then choose to play cards – this is how you take control of offices on the board. Next to each officeholder is a card icon which tells you how many matching country cards must be played in order to take control of that office. You may always use any 3 Country cards as a wild card substitute for a card you need. If the office is currently unoccupied, you simply play that number of cards and then place a marker on that space on the board. You take an additional marker and place it on the matching scoring tile for that office. 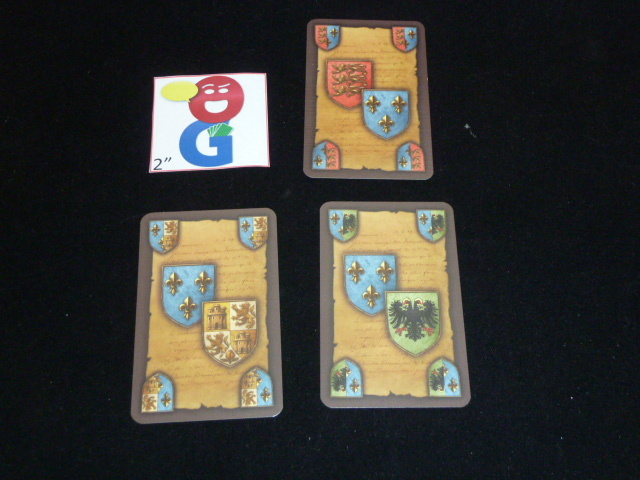 For instance, if I wanted to be the Baron in Dijon, France – I would play 2 blue cards from my hand, place a marker on the Baron in Dijon as well as a second marker on the Baron scoring tile next to the board. The other icon next to the office tells you how many influence points that office has over the country. If someone is already in that place, you must also play an Intrigue card that has the matching country on it OR play any two other Intrigue cards as a wild card in addition to the needed Country cards. (As a final exception, as it’s really hard to replace the King, you must play two matching Intrigue cards to take that office over…) You place your marker in the board space as well as an additional marker and place it on the matching scoring tile for that office. You also move the opponent’s piece which was on the board into the hexagon next to the city that you have taken over. You keep the opponent’s piece on the board for bonus scoring (to be discussed in a bit). It helps players remember which city that they have already been in. There is a bit of a rules translation snafu with the taking over of offices. In the English translation, which is the only way that I have played the game, the rules are pretty explicit that you cannot take over an office which you have already held. From some online postings, it appears that the German rules only prohibit you from kicking yourself out of an office – i.e. you cannot remove your cube from the Baron office and replace it with another cube of your color. However, if you were once Baron, but then John kicked you out, you could go back into that same city and take the Baron office back over (and place yet another cube on the Baron scoring tile). Before your turn is over, you must check and see if you are awarded any bonus tiles. In the setup, there is a bonus tile placed next to each city. Additionally, each country has 2 bonus tiles associated with the country itself. Finally, there are a set of bonus tiles located near the office scoring tiles. If you are the first player to occupy an office in a particular city, you collect the hexagonal token next to it. You will score these victory points at the end of the game. Removing this token also then opens up the hexagonal space on the board where displaced markers will end up. You should also check the country in which you just played. If you are one of the first two players to have a cube in each of the cities in that country (either as an active office holder or already displaced into the hexagonal space next to the city), you can collect the highest remaining shield shaped bonus token for that country. Finally, look at the office scoring tiles – if you have played a marker onto each of the seven tiles, you take the highest remaining circular bonus tile in the display. At that point, you turn ends. You check to see that you have 12 or fewer cards in your hand. If not, discard down to 12. Also, refill the Country card display at this time back up to three face-up cards. Play passes to the next player unless the Country card deck has run out and you are unable to replenish the display. If this happens, there is some interim scoring. 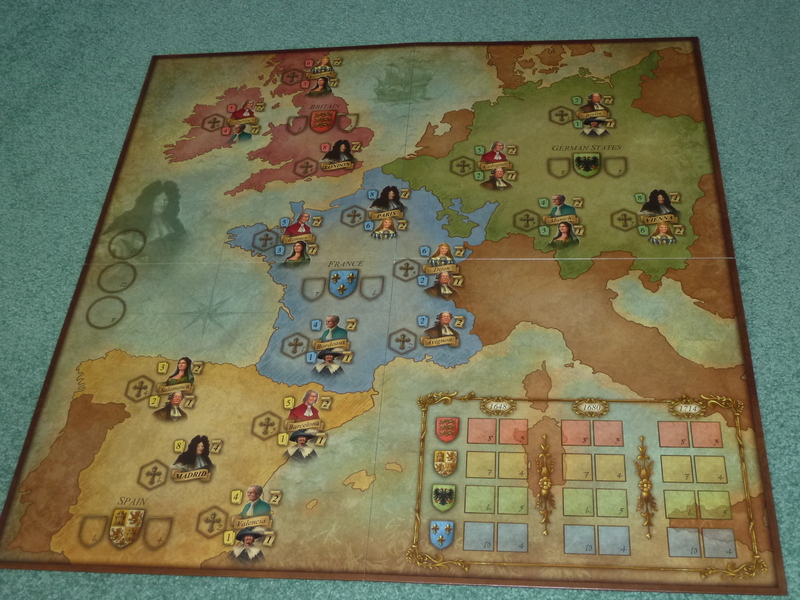 In the bottom right of the board is an area for all of the square shaped bonus tokens used for this scoring. In each country, the total amount of influence is totaled for each player – this is found in the golden scroll to the right of each office space. You only generate influence if you are actively holding an office – no points are scored for displaced markers! The player with the most influence gets the larger VP token for each country, and the second highest player gets the lesser tile. 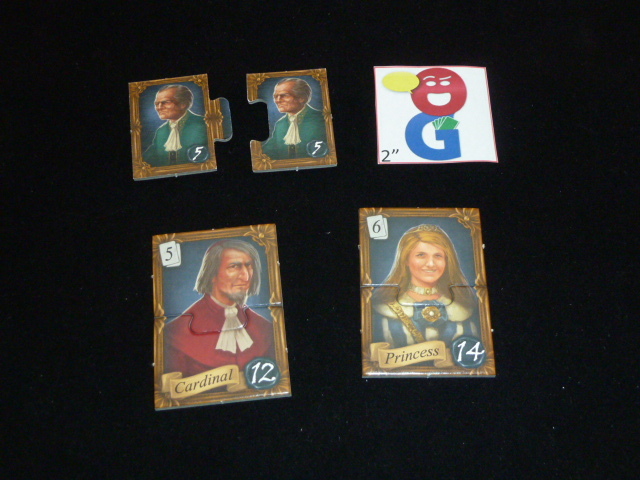 If there is a tie, the tie is broken by the player which holds the more prestigious office (King > Princess > Cardinal > …) Each of the four countries is scored – and then the game shifts into the next round. The Country card discards are shuffled to make a new deck, the display is replenished and the next player takes his turn. This interim scoring happens at the end of each of the three rounds. After the third interim scoring, there is a final bonus scoring involving the office scoring tiles. Throughout the game, each time that you take control of an office, you have been placing one marker on the board and one marker on the office scoring tile. Each of those tiles is now evaluated. If a single player has more markers than any other, he gets the complete tile and will score the VPs printed on that tile. If exactly two players are tied for the most number of markers, they split that scoring tile in half and each will score half the number of VPs seen on the complete tile. If more than two players tie for the most, the tile is discarded and no one scores VPs for that office. 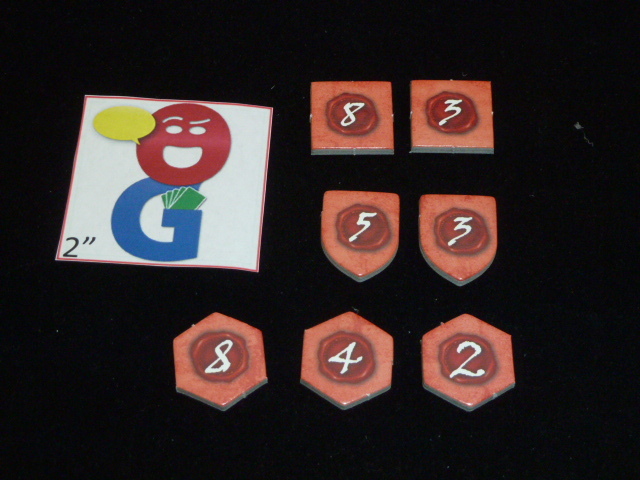 Once the 7 office tiles are distributed or discarded, players add up their VPs on all the tokens they have collected during the game. The player with the most VPs wins! If there is a tie, the player with the highest scoring individual marker wins the game. So, like many other gamers, I was a bit wary of this when I first saw it because I feared that it would be simply a prettier form of Heads of State – a game that I found to be too long and dry for my tastes. However, I am glad to say that Royals is a solid area control game that takes some of best parts of Heads of State but simplifies it into a well constructed strategy game. “WHAT IS THE SAME: The way you score points – controlling countries, achieving certain objectives and controlling the majority of each rank of noble. WHAT IS DIFFERENT: The mechanics by which you do this, which is the crux of the gameplay. 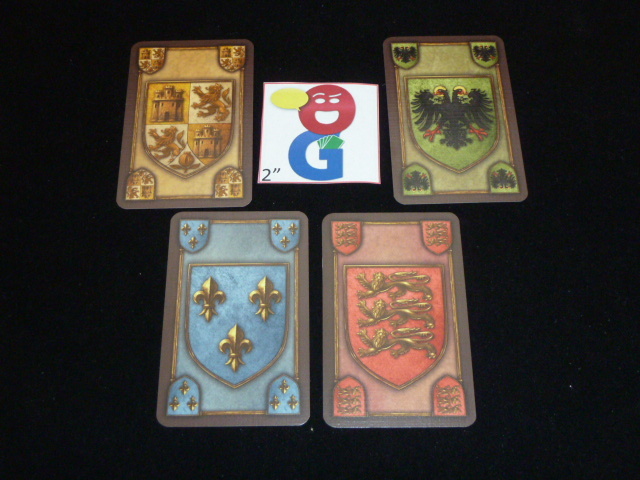 Card Drafting: In Royals you draft cards of a particular colour (country) to place nobles in a particular country. Your decision making turns on how powerful a noble you want and balancing short term regional VP gains against long term VP from control of countries. In HoS you draft sets of different cards to place a noble in any country. This was more time consuming because players had to consider all the options in the 4 countries and also consult a noble creation chart. Removal of nobles: In Royals the removal of nobles has been streamlined and any luck element greatly reduced. HoS had an Assassin who could fail and thwart you plans. Royals is a complex area control game – complex because you are competing for area control in four different areas on different time scales. First, there is the race to be the first in each city – as the first person there scores the VP chit for the city. Second, at the end of each round, you want to be in first or second place in influence in each country for more VPs. Third, there is another race – to be the first or second into all of the cities in a country. Finally, at the end of the game, you want to have played a longer strategy for area control over the office scoring tiles. Balancing out these four different ways to score points provides players with a multitude of options, and I have found in my experience with the game that focusing on different methods of scoring points can each get you to the highest total in the end. The game is long enough that you can even switch strategies (sometimes multiple times) over the course of the game as you see what your opponents are trying to do or based on what the tactical opportunities are based on board position and deck timing. Though there really is just one way to place markers on the board, the game still presents you with multiple paths to victory – and I have always prized that in games. The artwork is well done, and obviously better than Heads of State. Iconography is clean and the different shapes of the varied bonus tiles helps you identify them on a board which can admittedly get a bit cluttered with all the different tiles and cubes on it. I do think the split office scoring tiles are a nice visual touch. When I first played the game, I thought that the rules were well organized and easy to follow. We were able to dive right into our first game after a communal read-through of the rules right after we broke the shrink wrapping. Only after 6 games, in my preparation work to write this review, did I discover that there is a mis-translation of the rules – as I mentioned above in the section on replacing a marker in a city. FWIW, I would have never guessed that there was a translation error as the game plays just fine with the rules as written in the English translation. 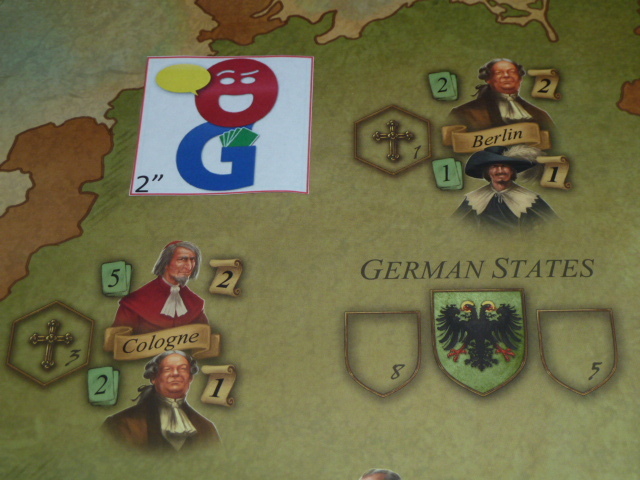 I have not yet had a chance to play the “German rules” – but I can theorize that it will give you even an additional option of when/how to play your cubes as you fight for majorities at the end of a round as well as on the office tiles. With the rules as written in English, there is a certain complexity in how you choose when and where to play your cubes – as you would not be allowed to go back into an office once you are kicked out – thus you have to manage the timing of taking offices in order to maximize their potential for scoring majorities at the end of the round. Overall, I have definitely enjoyed my games of Royals thus far, and though it was one of the last of the Essen 2014 games that I tried, it has steadily risen to the top tier of games from the show for me. I’m not sure how the German rules translation will affect play, but I certainly love the way the game plays as written in the rules that I have. Mark Jackson (one play): While I can see why Dale enjoys it enough to put it in his top five from Essen 2014, I kept thinking that I’d rather play Web of Power/China/Han than Royals. The added complexity doesn’t add enough to the game to make me want to play it again. Fraser (one play to date): I am one of the people who likes Heads of State, each time I played it I appreciated it more and more, as did a fellow gamer who was involved in most of my plays of Heads of State (ignoring the scary graphics which admittedly is very hard to do and I know some of those people). 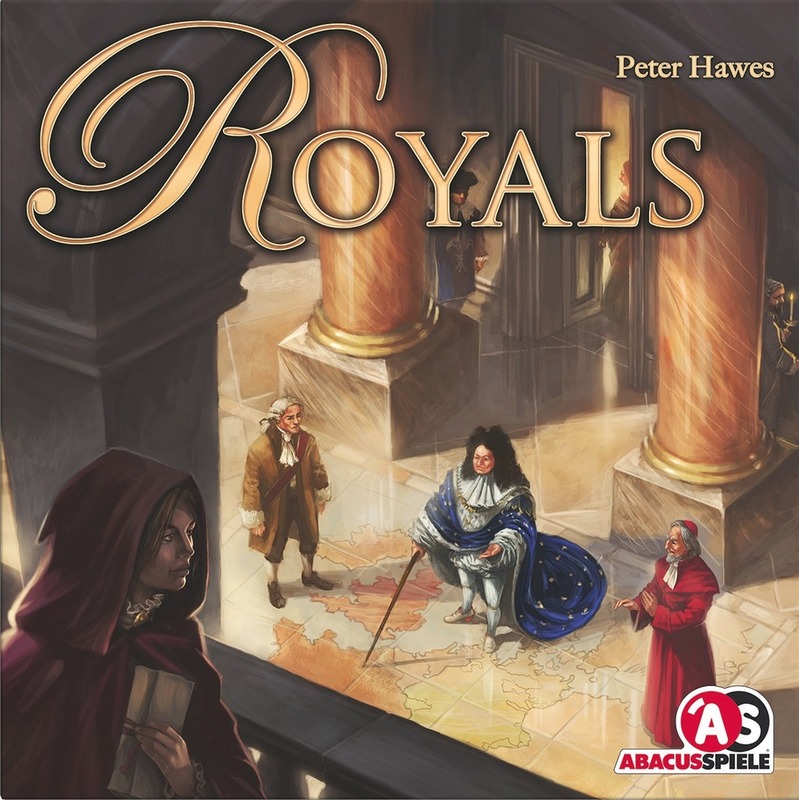 Recently at Cancon we both got the opportunity to play Royals being taught by Peter Hawes. We both really enjoyed it, it maintains the good parts of Heads of State and is streamlined, less luck dependent, quite a bit quicker and doesn’t have *those* graphics. The Web of Power comparison is a good one. I think Royals is very under appreciated but if you like bare bones streamlined euros, Web of Power will win over it. For me, though, WoP is _too_ streamlined … I like a little more chrome and Royals fits the bill! Good thing it’s finally coming to the US (soon). As expected from Dale, this is a very thorough review. I will clarify the rule question referred to. Played the way Dale played it, the game would be far to restrictive (great that Dale enjoyed the game played that way). But it would be way to easy for a player to be locked out of a country if he could only place a noble in a town once per game. For example, if a player’s 3 nobles in the 3 different towns of Britain were removed with intrigue cards, then this player could never place a noble in Britain again for the rest of the game. A great feature in Royals is the ability to respond to the actions of your opponents. The struggle for power and supremacy in each of the countries continues throughout the game. If one of your nobles is removed you may well want to get a new noble back into that town to regain the influence points that you lost.